This CV is placed on site in memory of Dr. Michael Bleyman, founder and director of the Carnivore Preservation Trust. He was my tiger mentor and friend. His love and dedication for the endangered carnivores, especially the tiger, will be a continuing inspiration to us all who knew him. Dr. Michael Bleyman was the founder and Executive Director of the Carnivore Preservation Trust and the International Scientific Coordinator for the Institute of Sustainable Tropical Resource Management. He traveled and worked in the Developing World for twenty-seven years. At left is Michael holding one of his favorite tigers – Romeo. Dr. Bleyman survived serious attacks by tigers, lions, bears, cougars and leopards. In one case an 850 pound tiger hurled Bleyman 25 feet into a steel pole after he removed a stick jammed into its palate. The unrestrained tiger’s reaction was one of joy and appreciation. These experiences lead Bleyman to develop a scientific method of humane free interaction with the great predators. 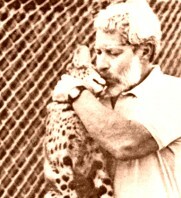 Dr. Michael Bleyman had more than 50 years of experience with the rescue and rehabilitation of wildlife. Trained academically in Biology and Genetic management, his lifelong goal was rescuing animals and saving entire ecosystems. He worked with the great cats on an intimate basis since 1963. He trained guard and attack dogs and was a leading expert in carnivore attacks. Bleyman combined his skills into developing methods of handling and moving easily around the world’s most deadly predators. 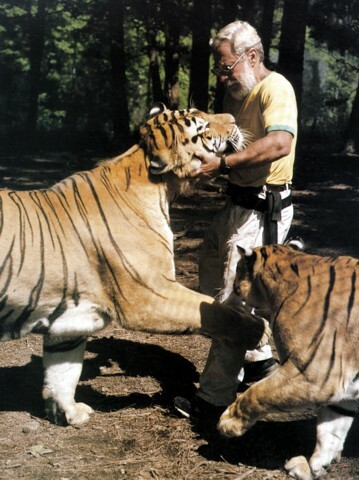 Dr. Bleyman was one of the few humans able to break up death fights between male tigers. He routinely defused male and female tiger battles. On the environmental front, Bleyman developed revolutionary genetic management plans for the recovery of threatened and endangered species. He was a world leader in demonstrating the complex dependence of the tropical rain forest on its mammalian components that he termed “members of essential keystone service guilds.” Finally, in practice, Bleyman pioneered and successfully demonstrated the importance of empowering local peoples with the future care of their ecosystems. In his lecture: “Saving the Indo chinese Tiger,” Dr. Bleyman described the process and implementation of planned habitats to prevent the destruction of ecosystems. The major cause of animal destruction is pernicious poaching. Our goal is the struggle to defeat poaching driven by the Traditional Oriental Medicine trade. High School Diploma: Stuyvesant High School, NYC 1955. A.B. : Brooklyn College, City Univ. of NY, Brooklyn, NY 1959. M.A. : Indiana Univ., Bloomington, IN, 1964, Zoology. Ph.D.: Univ. of Illinois, Urbana, IL, Microbiology, 1968. Executive Director of Carnivore Preservation Trust, Pittsboro, N.C. 1981-1996.
International Science Coordinator, Institute for Sustainable Tropical Resource Management 1994-1996. Previous position Director of Carnivore Evolutionary Research Institute 1983-91. Research Fellow, Lineberger Cancer Research Institute, 1985-86. Director of the Carnivore Evolutionary Research Institute, Pittsboro, NC, 1973-81. Geneticist, Drug Resistant Pneumonia Program, Duke Univ. 1979-81. Research Geneticist, Center for Alcohol Studies, 1977-79. Adjunct Assoc. Prof. Pharmacology, 1978. Senior Field Scientist, Agency for International Development, Malaria Eradication Program, (University of New Mexico, South America Africa) 1975-77. Adjunct Assoc. Prof. Biochemistry and Nutrition, Univ. of North Carolina, Chapel Hill, NC, 1969-1975. Assistant Professor of Zoology and Genetics. Research Assistant Professor of Zoology Univ. of Illinois. Rehabilitation and rescue experience since 1941. Volunteer at New York Zoological Park 1949-1954. Volunteer at Staten Island Zoo 1952-53. Volunteer at Brown County Zoo 1963-64. Volunteer in keeper training of animal handling North Carolina Zoological Park 1972-76. Lecture Courses: Introduction to Zoology; Introduction to Biology and Cell Biology; Genetics; Molecular Genetics; Regulatory Mechanisms, Conservation Biology, Ethics and Conservation. Laboratory Courses: Introductory Zoology; Genetics. Seminar Courses: Mechanisms of Gene Transcription; Evolutionary Mechanisms; DNA Duplication; Biological Basis of Cancer; The Genetic Code; Molecular Evolution; The Biology of Human and Primate Behavior. Lecturer in wildlife management and care at various veterinary schools. Lectures in courses on Endangered Species, Conservation Biology and Ethics and the Environment. Graduate Teaching Assistant at Indiana University. Laboratory in General Zoology; Genetics Parasitology; Recitation sections in Analytical Reasoning; Formal Semantics. Special Courses at University of North Carolina, Chapel Hill: Independent Studies, both reading and research for Undergraduates. Genetics–Techniques in bacterial genetics (including conjugation, transformation, transfection and transduction); Ciliate genetics and mammalian genetics involving laboratory and zoo animals. Developer of transcriptional mapping techniques. Electron Microscopy–Mounting and spreading techniques for visualization of DNA length and configuration studies and DNA protein interaction. Biochemistry–Fifteen years of research employing almost every tool of nucleic acid chemistry. Extensive experience with enzymology, chromatographic techniques, and with a wide variety of radioisotope tracer techniques, including use of restriction enzymes and in vitro labeling of RNA of proteins, Genetic Engineering. Microbiology–Considerable practical and teaching knowledge of methodology for handling bacteria, viruses and protozoa ranging from single cell isolation to small plant size fermentor techniques. Studies of a metabolic, genetic, medical, ecological and evolutionary nature. Zoology–Over fifty three years of animal keeping, breeding. Alcohol Metabolism–Liver perfusion analysis, enzymology,and in vitro techniques. Vast expertise in mammalian capture without harm and chemical restraint. 13 years of consultation on wild animal laws. Three years of consultation on wild and domestic animal attacks.